You can use this basic custard filling and add just about any cooked vegetable or meat to make your own specialty. Quiches are usually best when they are simple. The simplest is just a combination of eggs and cream and cheese, baked in a pie shell. This recipe is a bit different because it uses a white sauce. That makes the quiche much fluffier and gives it a very velvety texture. You really need to drain the spinach well for this recipe. Chopped frozen spinach holds a ton of water. If most of that water isn't removed, it will release during baking and the quiche will never set up properly. Squeeze it in your hands, then put it in a kitchen towel and squeeze well. You can make this recipe with other ingredients if you'd like. Some chopped and drained artichoke hearts would be wonderful, as would some cooked asparagus, cut into 1" lengths. You could also add cooked bacon or ham to the recipe. 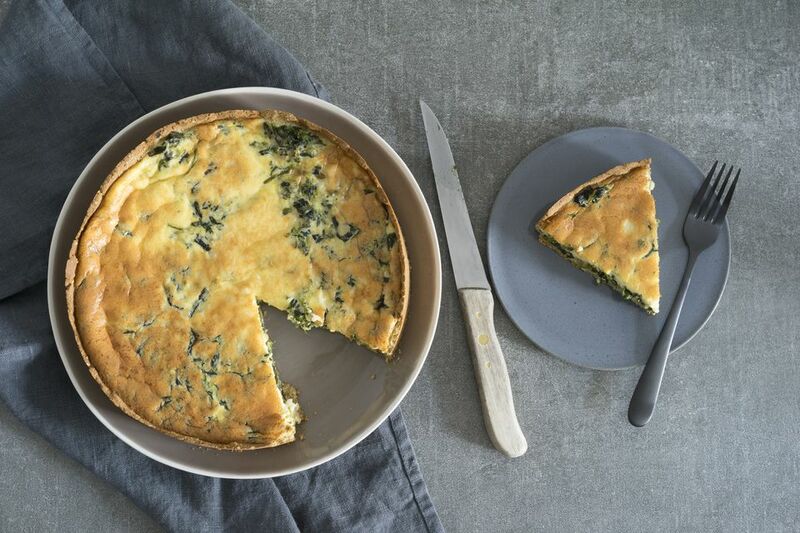 Serve this quiche with a green salad tossed with avocados, and some iced tea or milk. This makes a lovely lunch or light dinner for company. Preheat oven to 350°F. Prepare the pie crust and set aside. In a heavy skillet, melt butter over medium heat and add onion and garlic. Cook and stir for 4-5 minutes until vegetables are tender. Add flour; cook and stir for 3-4 minutes until bubbly. This is called making a roux. Then add the half and half and cook, stirring constantly, until mixture thickens, about 4-5 minutes. Remove the skillet from the heat. In a large bowl, combine sour cream, salt, pepper, eggs, and nutmeg and beat well to combine. Stir in onion mixture. Make sure spinach is very well drained (press it between layers of paper towels or squeeze it in a kitchen towel) and fold into mixture. Add Havarti and Colby cheeses. Pour the spinach mixture into pie crust and sprinkle with the Parmesan cheese. Bake the spinach quiche at 350°F for 40-50 minutes until filling is puffy and set. Let stand 5 minutes, then cut into wedges to serve.